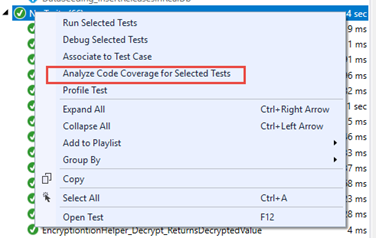 When you run unit tests in visual studio and select the option to “Analyze Code Coverage for Selected Tests” (as seen below), by default, code coverage results will not be captured. As of writing of this post, the fix is to modify the project file and enable DebugType to Full on the propertygroup section of the project file. Save the project file and run the unit tests again by selecting the option: to “Analyze Code Coverage for Selected Tests” and you’ll see similar results as shown below. As you saw within Visual Studio, running tests with code coverage can be trigged via a simple click on the context menu. 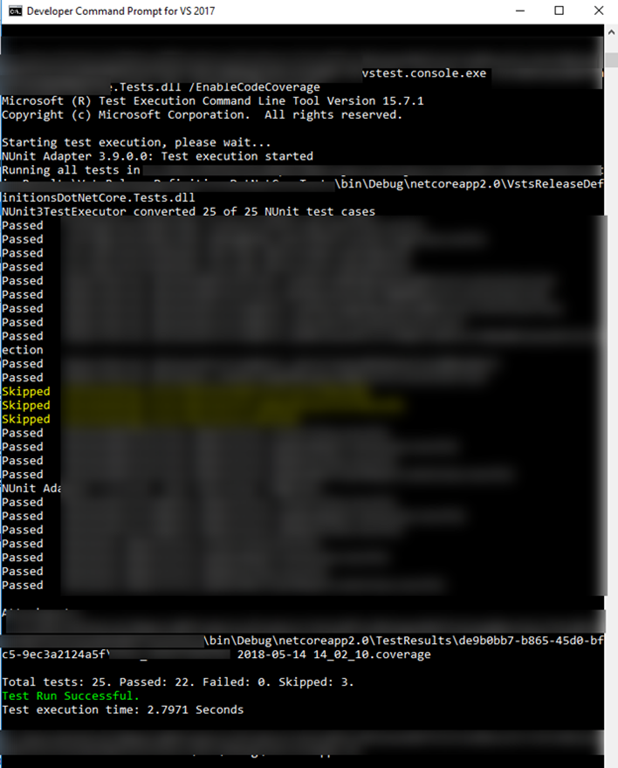 If you want to execute your unit test with code coverage in a command line, you invoke /EnableCodeCoverage switch. Use [ExcludeFromCodeCoverage] attribute wherever appropriate. When a section of code is decorated with this attribute, that section of the code will be skipped for code coverage. Why? In certain cases, you don’t want code to be measured with code coverage. An example would be entity objects that have default property setters (get / set) that has no functionality. If there is “NO” logic developed on either the get and/or set property why measure it? This ends the first part of this series, on the next part (VSTS Build Definition Setup – .Net Core and NUnit), we will hook up the test tasks in VSTS to include code coverage reporting.